JIM Murphy will formally step down as Scottish Labour leader today, as the party’s ruling body meets to decide on the timetable and process to elect his successor. Mr Murphy is to submit a report on the future of the party to Scottish Labour’s executive committee, which will discuss a series of radical proposals for reform. 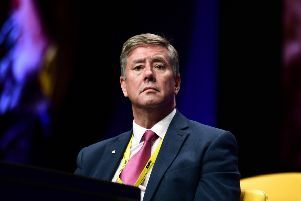 The meeting in Glasgow will consider whether his successor will be chosen by a one-member-one-vote ballot rather than the old electoral college system that gives a formal role to affiliated trade unions. There will also be a proposal to reopen the selection of Scottish Labour’s candidates for regional list MSPs in a bid to attract new blood and fresh talent to the party ahead of the 2016 election. Scottish Labour’s executive is expected to set out the timetable for the forthcoming election of the leader and deputy leader of the party. Mr Murphy announced last month that he would quit after narrowly surviving a vote of confidence of the executive committee following Labour’s near meltdown in Scotland on 7 May. Kezia Dugdale, who has been Mr Murphy’s deputy, and MSP Ken Macintosh are the only two candidates to have declared in the leadership contest so far.